The U.S. Federal Reserve is keeping its benchmark interest rate unchanged at a time of low inflation, which remains persistently below the Fed's target level. The Fed noted Wednesday in a statement that inflation has stayed undesirably low even though the job market keeps strengthening, with the unemployment rate just 4.4 per cent. Normally, solid job growth drives up wages and prices. But the Fed's preferred gauge of inflation has moved further below its two per cent target in recent months. The central bank decided after ending its latest policy meeting to leave its key rate unchanged in a range of one per cent to 1.25 per cent after having raised rates twice this year in March and June. The Fed says it still envisions further "gradual" rate hikes. But many economists say they foresee no further rate increases this year unless inflation picks up. Federal Reserve's Janet Yellen says more rate hikes coming to U.S.
With the U.S. job market still solid after eight years of a grinding but durable recovery, the Fed has essentially met one of its two mandates — to maximize employment. But it's so far failed to achieve its other goal of stabilizing inflation at a favourable level. Inflation has been edging further below the Fed's 2 per cent target in recent months. The problem is that too-low inflation can slow the economy by causing consumers to delay purchases if they think they can buy a product or service for a lower price later. Months ago, the Fed had signalled its readiness to raise rates three times this year on the assumption that it needed to be more aggressive to ensure that consistently low unemployment didn't contribute to high inflation later on. But in testifying to Congress this month, Chair Janet Yellen had sounded less sure about her previous position that the slowdown in inflation this year was due to such temporary factors as a big drop in charges for cellphone plans. Yellen conceded that Fed officials were puzzled by recent developments. Her remarks lifted financial markets as investors interpreted her words to suggest that the Fed might slow its pace of rate increases. Over the past 12 months, the inflation gauge the Fed monitors most closely has risen just 1.4 per cent, according to the latest data. That's down from a 1.9 per cent year-over-year increase in January. Many economists say they think the Fed will put off any further rate hikes until inflation resumes rising toward the its two per cent target. After leaving its key rate at a record low near zero for seven years after the 2008 financial crisis, the Fed has raised it modestly four times — in December 2015, December 2016 and twice so far this year, in March and June. Even now, the rate remains historically low and significantly below the three per cent level that the Fed sees as "neutral." That's the point at which the Fed's benchmark rate neither stimulates nor slows economic activity. 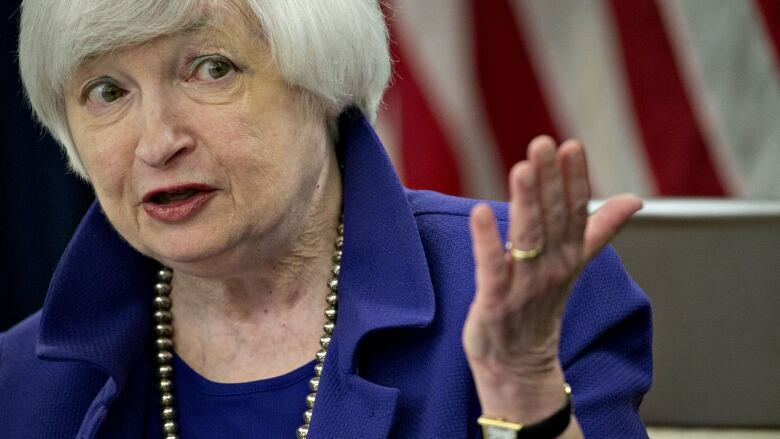 In her congressional testimony Yellen didn't rule out another rate increase this year. But investors have themselves grown more uncertain, with the CME Group's closely watched gauge foreseeing a 52 per cent chance of another rate increase by year's end. The Fed's statement Wednesday coincides with a period of lacklustre growth for the U.S. economy. During the January-March quarter this year, the gross domestic product, the broadest gauge of economic health, grew at an anemic 1.4 per cent annual rate — well below a healthy pace and far below the consistent three per cent or more annual growth that President Donald Trump's administration has said it can achieve. During the April-June quarter, the economy is generally thought to have grown at an annual rate of about 2.5 per cent. The government will offer a preliminary estimate of that figure Friday. Fed watchers are also waiting for the central bank to announce when it will start gradually paring its enormous $4.5 trillion US in holdings of Treasury and mortgage bonds, which it accumulated after the financial crisis in a drive to ease long-term borrowing rates. Some say they think the Fed will begin in either September or October to gradually shrink those holdings, a move that's expected to put upward pressure on long-term borrowing rates, including mortgages.